Many researchers jump right into the vast world of genealogy, but do not learn some of the fundamental pieces of the foundation. 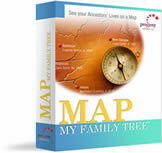 A large part of any genealogist's foundation, is their genealogy computer program (Legacy Family Tree). Knowing how to effectively use it, from the beginning, will ensure a solid foundation. To help you "do it right the first time", we have created a series of training videos on CD. The goal of videos is two-fold. 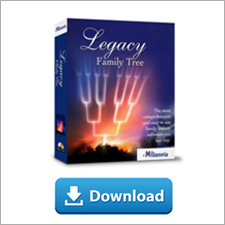 First, you will learn how to use the Legacy genealogy software. 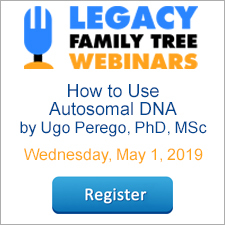 Second, and perhaps most importantly, you will learn various techniques that combine genealogy principles with your data entry. In other words, these CDs will be full of real examples that you can apply to your own research problems. For this reason, a CD which is produced at the beginner's level, will actually benefit users of all expertise. These CDs are also designed to build on each other. What you learn in the first CD will help you better understand the following CDs. 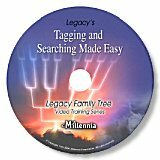 If viewed, and practiced in order, you will be able to spend less time trying to learn how to use the computer, and more time doing what you love - genealogy! Legacy for Beginners. This video walks the beginning Legacy user through the basics of the program. View it free here. 48 minutes. Watch a preview. Purchase. Your 12-Step Checklist to Using Legacy. Every Legacy user should follow these 12 steps when working with their family file. 48 minutes. Watch a preview. Purchase. Legacy's Ultimate Guide to Sources. Genealogy without documentation is mythology. Learn all about proper source documentation. 34 minutes. Watch a preview. Purchase. Researching with Legacy: Mastering Events and Chronologies. Learn how to properly enter and cite the documents you find. Watch a preview. Purchase. Tagging and Searching Made Easy. Learn how to take advantage of the searching and tagging features in Legacy. Watch a preview. Purchase. Creating & Sharing Perfect Reports. Become an expert in creating and sharing reports. 58 minutes. Watch a preview. Purchase. Insider's Guide to Legacy: Tips & Tricks. Get the "insider information" about Legacy. 40 minutes. Watch a preview. Purchase. Video Guide to Working with Digital Pictures in Legacy. Learn the "before-scanning-your-first-picture rules" and the ins/outs to using pictures in Legacy. 52 minutes. Watch a preview. Purchase. We wish all of our Legacy users a Merry Christmas! Happy holidays from the Legacy team: Dave, Ken, Jim, Sherry, Geoff, Luc, Brian, Pegi, and Diane. Most genealogists begin their research without understanding the importance of documenting what they find. Adding these sources just does not seem important at the time. Over time, most of these genealogists begin to understand the value of proper documentation, and desire to examine their family file to enter the sources they have collected. We're often asked, "How do I create a list of ancestors for whom I have not added any sources?" Click on the View menu, click on Master Lists, and click on Source. The Master Source List appears, giving you a list of all sources that you have added. Highlight all of the master sources by a) clicking on the very first source in the list (to highlight it); b) scroll to the very bottom of the list and press the shift key while clicking on the last source. This will highlight all of the sources in the list. Click on the Show List button. This is the list of everyone in your family file that has a source linked to them. Select a tag number at the bottom, and click on Tag Everyone in List. IMPORTANT - before you do this, follow the two rules of tagging described in the Tagging and Searching made Easy video. Watch a preview of the video here. Click Close. Click Close again. Click on the Create List button, and you now have a list of everyone in your family file that has zero sources linked to them. You may wish to tag this list so you can easily work with them in the future. Understanding the basics of Searching and Tagging provides Legacy users with answers to many of these types of questions. For more information, watch Tagging and Search Made Easy, or purchase it here. 1911 England/Wales census - an early release! For those waiting for the 1911 census of England and Wales, you just moved up in line! The National Archives recently announced that because of the Freedom of Information Act, portions of the census will be available as early as January 2007. If you know the address of the 1911 resident, The National Archives will offer a limited research service. They hope to offer a searchable online service in early 2009. The census in its entirety cannot be legally released until 2011. To learn what will be available and when, visit http://www.nationalarchives.gov.uk/1911census/. Blogs are the hottest new thing in genealogy. 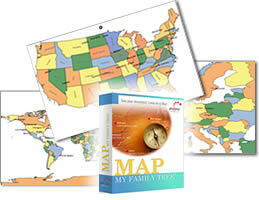 They serve as a way of learning about genealogy, technology, and communicating research results with family. Legacy News is a blog (short for web-log). Since JL uses Legacy, many examples are given on how to incorporate technology with our software. If you like technology and genealogy, JLog is definitely one to add to your RSS reader or favorites list. Visit JLog here. I'm in the process of reviewing my entire Legacy database of individuals looking for missing information. I want to create a list of ONLY the male individuals of my surname indicated as having a spouse but no marriage information. Any ideas? Gary, this can be done with a little creativity, and with a couple of different approaches. In Legacy, click on the Search button. Click on the Detailed Search tab. Add the following conditions, and make sure to use the AND option for each condition. Be sure that when you click on the "Second Condition" checkmark, that you select the "And" option. Now, click on the Create List button at the bottom. You now have a list of all males of the desired surname, who are married, but do not have a marriage date. In Legacy 6.0 Deluxe, first navigate to the desired family. Click on the Reports icon at the top. Click on the Books/Other tab. Under the Book Reports section, click on the Ancestors or Descendants button. On the Options tab, make sure that the Insert Underlines options are selected (see image below). I have entries where a male and female produced a son. The couple never considered themselves to be "wife" and "husband" and would not want to be displayed that way, even in private reports for their own records. Is there a way to specify non-traditional pairing terms in any or all "views" and reports? Yes, Legacy has custom wording options to accommodate these situations. From the Family View, open the Marriage Information screen by clicking on the marriage bar in the middle. In the lower part of the screen is a section entitled "Wording Options." If this couple was not husband and wife, simply change their labels here. For example, instead of husband/wife, change it to father/mother. When you're finished, click Save. This customized wording applies only to this couple. When you print reports, such as the Family Group Record, select the option to "Use the phrases from the marriage records." This option is found on Family tab of the reports.